Almost every time I craft I learn something new. Sometimes even when I craft something I’ve done before, I find a new way to speed up a process. I often learn the most from my mistakes . . .what not to do the next time. Today, I decided to make a card for an upcoming nephew’s birthday. I usually find it difficult to craft guy-themed stuff because I like frills, glitter, flowers, hearts and other girly-girl embellishments. Anyway, I decided to start with a black card…all boy. This nephew was recently in a robotics competition so I found a robot rubber stamp in my collection. 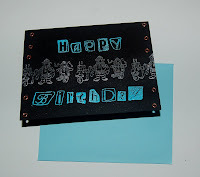 I wanted to keep the card simple so I thought maybe I would just stamp ‘Happy Birthday” with the robots in a row. I think colors are an easy way to establish a masculine tone to the card so I decided to use silver and turquoise because they would also stand out on the black. Anyway, I stamped and embossed with the same color powder as the ink so that any part that didn’t get embossed would still be the right color. I discovered that on the black card if the embossing powder didn’t stick to all of the inked design, the non-shiny design is really noticeable. To correct this problem I used an embossing pen (clear) to fill in the missing parts and re-embossed the design. I’m happy to say that this worked well and the card came out just right. The finishing touch was the copper eyelets that I added to the sides of the card. The rubber stamp letters were ‘Ransom Alphabet’ Clear Choice Stamps from Royal Brush Mfg. and the robot rubber stamps are by Personal Stamp Exchange. (I'm not sure if PSE is still in business.) Actually any machine-type rubber stamp (cars, planes, tools, etc.) could be used instead of the robots to give the card a masculine look. The ransom alphabet stamps are my new favorite letter stamps because you don’t have to line them up exactly since they are supposed to look messy. It’s difficult to get much done when I’m so disorganized. I keep clearing off my work desk and it keeps filling up. It’s totally irritating to try to work on a 1ft. square of space and ridiculous since the desk is huge. One of the drawbacks of cleaning up and putting away is losing track of where I put everything (even though I do label my bins). On the up side, I do discover treasures I’ve stored away years ago. I am a really good pack rat. 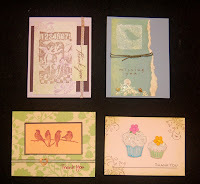 The first photo shows a few of the cards that I made (using my new rubber stamps) in between tidying up. I decided to make a bunch of thank you notes (not written in) to give to my sister as my way of thanking her for her hospitality while we were in Washington. The other photo shows a necklace and earring set I made to match a favorite blouse. I found the beads while shopping at the Bead Shoppe in Mapunapuna. The pink and black colors of the large beads and the faceted shapes give the jewelry an art deco look, which I really like. Combining the beads with copper findings and beading wire pulled the whole piece together. I will try to put the instructions for the necklace on the website so you can make it for your mother, grandmother, or yourself. This design is really simple and you can easily adapt it to other beads. 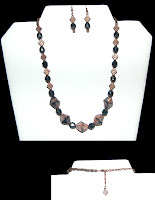 Turquoise and copper would be a pleasing combination and very trendy today. I have discovered that the Bead Shoppe stocks a good assortment of glass beads (many extra large ones) at very reasonable prices. When I leave the Bead Shoppe I always feel that I leave with more jewels to put in my (organized) treasure chests! I’ve been away on two trips. The first one was to Washington during Easter. I only visited one craft related store, Impress, (a rubber stamp shop). It was a small store but I still found several stamps and embellishments that were new to me. There were lots of silhouette stamps, many with birds or New Orleans style. I’ve noticed that many magazines are featuring silhouette designs on their projects. I’m having fun making cards with my new treasures and I’ll try to post them soon. In Honolulu I visited the Mapunapuna Ben Franklin Crafts. Of course, I stopped at the Bead Shoppe first where I purchased pearls in new shapes and large sizes. I was pleased to see that the store had strands of gemstone beads similar to other bead shops but at greatly reduced prices. Some of the cutest beads I found was a strand of polymer mouse beads. I’m not sure what I’ll do with them but I just couldn’t resist buying them. At the BFC store I found some unique clear albums and instruction booklets, new K and Co. papers (colorful children prints) and kits (punch out purses and boxes), a rotary letter stamp from Provo Craft, and beautiful Bohemia papers and embellishments from My Mind’s Eye. As I make projects with these new items I will post photos and instructions on this website.